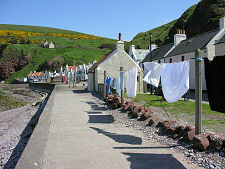 If you're a film buff, then Pennan may look a little familiar. 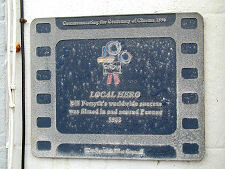 In 1983, parts of the film Local Hero were shot here: though not the beach scenes, which were filmed on the other side of the country near Arisaig. 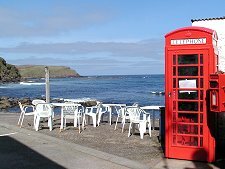 The film gave Pennan one of the best known red telephone boxes in the world, sitting on the quayside opposite the Pennan Inn and attracting a steady stream of visitors over the years since: though the one actually shown in the film was a prop placed nearby. 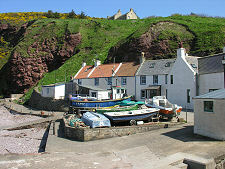 It is tempting to describe Pennan as unique, though in fact it has a lot in common with nearby Gardenstown and Crovie. It sits at the base of a north-facing cliff looking out to sometimes stormy seas. 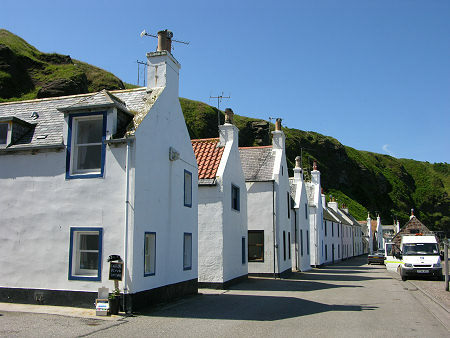 There is just enough space between the bottom of the cliffs and the sea for a single row of dwellings, many placed gable end on to the sea to reduce their exposure to the elements. Access is down a narrow and steep road that emerges onto the village's single street at a tight junction next to the Pennan Inn. There is a small car park at the western end of the village. 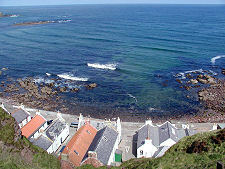 Visit Pennan on day with blue skies and blue seas setting off the white cottages and brightly coloured boats, and it can seem an idyllic place. 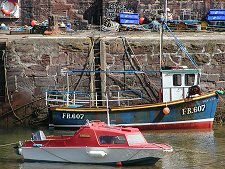 Visit it on a day with an arctic gale howling straight into Pennan Bay from the north, with the visibility obscured by salt spray, and with the sea crashing into the pebble beach and sea defences, and it can feel altogether different. 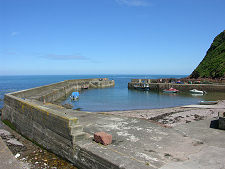 At the east end of Pennan lies its harbour. These days it is still used by a couple of fishing vessels, but otherwise its life revolves around leisure craft. Today's harbour is the latest in a succession over the years. The first was built here in 1704, but it had fallen into disuse by the end of the century and a replacement was built in 1799. By 1840 this harbour, too, was no longer usable, and a bigger and better one was built in 1845. This third harbour lasted until a storm one night in the winter of 1889/1890 destroyed the west pier, which was replaced in 1903. The harbour was further improved in 1909 and again in 1981. Threats to the wellbeing of the village have not just come from the sea. 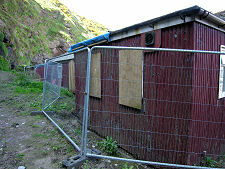 In August 2007 Pennan was in the news when a mudslide from the cliffs behind damaged parts of the west end of the village, including the village hall. Then, at the end of 2009, a landslide temporarily blocked a footpath at the eastern end of the village. 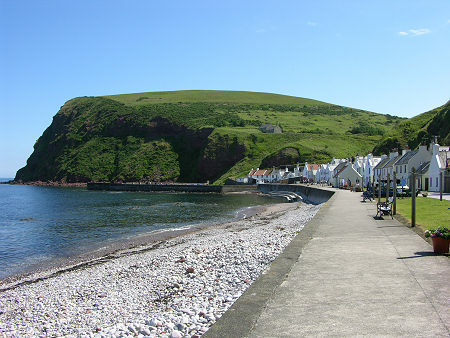 Pennan was well known in the nineteenth century for the millstones that were quarried to the east of the village, and which were shipped out from the harbour, or simply rolled on their edge to more local destinations. Rolling a millstone up the hill behind the village must have been a challenge. Today there is little to do in the village other than stroll the main street and the harbour, skim stones, or just watch the sea rolling in. 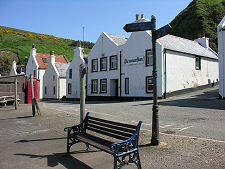 But Pennan is well worth a visit simply because it has a unique atmosphere and character: and film buffs will find a particular attraction in using that very special phone box. The focus of the village should be the Pennan Inn: and the good news is that since October 2009 when the Pennan Inn reopened under new ownership, it has been once more. This followed a decade or more of mixed fortunes, and a visit we made in 2008 found it closed down and looking rather tatty and forlorn. This was despite a refurbishment in 2002 which included a new exterior coat of paint. 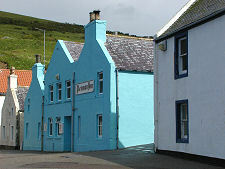 Unfortunately the colour chosen was blue rather than the white traditionally applied to most buildings in the village, and as a result a colour scheme that would have seemed positively conservative in Tobermory or Portree caused considerable local controversy. 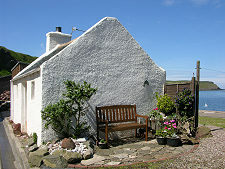 The inn was repainted white in 2004, but subsequently closed. A visit in May 2012 found the Pennan Inn offering a very warm welcome on a day that was much more dreich than the ones shown on the images on this page.